Andrea Pirlo announced his retirement from football today at the age of 38. This article takes us back to May 2011, when Pirlo was on the verge of moving to Juventus. The divorce was quieter than you would have expected. There were no hysterics from either side, and the gossip surrounding the couple was spared by considerations of the long, good run they had. After all, a ten-year relationship is a lifetime in today's football. The reason of the divorce was simple and heartbreaking: one of them had fallen out of love with the other. Andrea Pirlo and Milan were a vaunted item for ten years, but Milan now want someone younger and feistier. They no longer need a player who sees the football field uncluttered, who can find his man over players, hills, and mountains. A few days ago, Milan assistant manager Mauro Tassotti succinctly summarized what many had feared and expected: "he isn't the type of player the coach [Massimiliano Allegri] wants." Who could argue with Allegri? He has just won a Scudetto largely without Pirlo, who was injured for most of the season. Milan didn't really miss him. It wasn't a case of absence making the heart grow fonder. Milan's midfield has players--Mark van Bommel, Massimo Ambrosini et al.--who don't have the elegance or vision of Pirlo, but who are capable of winning the ball, keeping it, and running with it, all on their own. It is for their tactical ability that Allegri prefers them. Furthermore, the coach already has a player (though no one can tell for how long) who can provide the required skill and directness in midfield. As maligned as Clarence Seedorf is by Milan fans, he can compensate for the heavier touches of players like Mark van Bommel and Massimo Ambrosini. Consider also that Kevin-Prince Boateng was the trequartista of the Milan side this season, which says heaps about what Allegri prefers: direct players who can keep the tempo not ticking like Il Metronome--an epithet for Pirlo--but bursting. The idea that Pirlo is a luxury in today's footballing context has persisted for a long time. The theory goes that in modern football you need players who can do defensive duties in midfield while plotting creatively. To some extent, it is true: in his role as regista, a deep-seated playmaker who sits in front of the defence, Pirlo has been coddled by diligent midfielders around him. The tactical adjustment always made sense because it accentuated the natural visionary capability of the player, and because Milan have traditionally had combative midfielders. Some also argue that Pirlo does not function well as a conventional playmaker because the lack of protection around him leaves him exposed. However, despite the common criticisms of his ineffectiveness further up the park, Pirlo was successful for Milan even as a trequartista, especially during the latter part of the 2001-02 season. 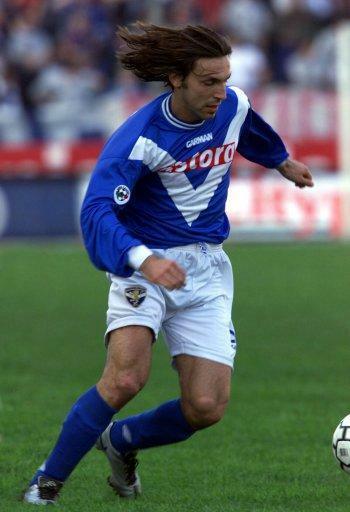 It was the presence of Rui Costa and Clarence Seedorf that prompted Carlo Ancelotti to move Pirlo to a deeper role, a role that he had played under Carlo Mazzone at Brescia. By the adjustment, Ancelotti accommodated all three players. It was as a regista that Pirlo earned acclaim, but he he could play well in different set-ups as well. During Italy's triumphant 2006 World Cup campaign, he played a more advanced role in a flatter midfield that had the assurance of Fabio Cannavaro behind it, and Gennaro Gattuso in it. The result was a tournament that definitively established Pirlo as a midfielder of startlingly rare and refined talent. Where the more direct, all-action midfielder like Frank Lampard failed, Pirlo stamped his authority on the tournament with patience, equanimity, and, most importantly of all, an incisiveness that isn't always apparent from the langour with which he moves with or without the ball. His pass to Fabio Grosso, which resulted in the winning goal of the semi-final against Germany, only came about from a corner that he had originally won. The pass, though not his best, also recalled the brilliantly weighted one that Demetrio Albertini, Milan's Il Metronomo of the 1990s, provided Roberto Baggio in the 1994 semi-final against Bulgaria. Albertini and Pirlo are certainly different players in several ways, but they were able to position themselves freely on time's continuum, thinking and seeing seconds in advance. Not to build a team around, or at least with, a talent like that takes temerity, but Pirlo has somehow eluded many in football. Inter's decision to sell him to Milan in 2001 is now a running joke, but it is sobering when you stop to think about it. Admittedly, there was stiff competition for a starting place in that Inter team, but selling Pirlo to a direct rival remains a colossal blunder. There have been months during which Pirlo has struggled for form, but it is hard to escape the feeling that ideas about him have ossified over the years because of how protean he is as a player and as a personality. That is, because he is so difficult to characterize entirely, people have continually circulated the same timeworn notions about the player. Pirlo does fly in the face of neat definitions. As a midfielder who was at the absolute top of European football for a good part of the last decade, he was and is seldom seen wheeling through the middle of the park. Instead, he possesses an innate sense of economy that sees him cover vast areas of the field without the urgency that many come to expect from midfielders. His sleepy appearance contributes to his critic's accusation that is as self-discrediting as it is self-describing, namely that Pirlo is lazy. He may often stroke the ball around, dither on it even, but he has on many occasions decided the outcome of a game in a second. One thing that is certain is that Pirlo is leaving Milan for Juventus. The Rossoneri will probably bring in a player more consistent with their new philosophy, but the fact that Pirlo, at the age of thirty-two, is still coveted by a top club tells a lot about the quality of the player. He exits Milan with grace and an outstanding amount of success. Two European Cups, two Scudetti, and a World Cup will always be concrete achievements of a player that has often proven difficult to understand completely. At his age he has a lot left to give. You have just landed yourself a player that can keep things ticking for at least another three years.